29 1/2" by 38", this layover sham combines the subtle texture of medium-weight (heavier than sheet material) white linen with hand finishing. The 2" deep hem is neatly mitered at the corners and finished with a single row of open hemstitching. A stunning 13 1/2" by 24" design spreads across the lower center. The focus is a 9" tall shield-shape lace medallion. 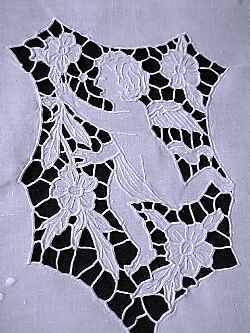 A cherub and flowers stand out against the cutwork lace background. Closely-worked buttonhole stitching finishes the edges and forms sturdy connectors. 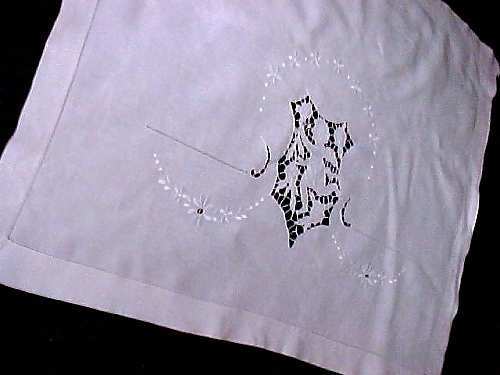 Buttonhole and outline stitch details complete the design, with petals, curly hair, facial features, etc. Embroidered garlands and wreath, lace curly-ques and drawnwork lace stripes complete the design. 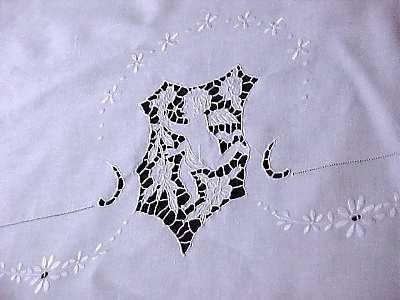 Selected threads are removed from the fabric to create openwork stripes. Smooth, silky satin stitch adds a soft sheen to flowers, dots and leaves.  This sham is in very good condition; washed, ironed and ready to use.